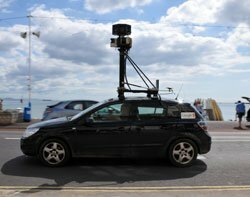 Google has admitted to the Information Commisioner's Office that it failed to delete all the Wi-Fi data collected by its Street View vehicles. Last month, the ICO demanded proof that the Wi-Fi data collected by the Google Street View vehicles was deleted, as had been agreed with Google in 2010. The ICO is among a number of data protection authorities that ordered a review of investigations after the recent release of a report on Google's Street View data capture by the Federal Communication Commission (FCC), which revealed that a Google engineer had deliberately written software to enable Wi-Fi data collection. In a letter to the ICO, Google's global privacy counsel, Peter Fleischer, said Google had recently confirmed that it still has a small amount of the payload data collected in the UK. "Google apologises for this error," Fleischer said. According to Fleischer, Google has been reviewing its handling of Street View data, involving thousands of disks. "In conducting that review, we have determined that we continue to have payload data from the UK and other countries," Fleischer said. Fleischer said Google would like to destroy the data, but would give the ICO the opportunity to review or destroy the data. "Google remains committed to working with the ICO on this matter," Fleischer wrote. The ICO said this data was supposed to have been deleted in December 2010. "The fact that some of this information still exists appears to breach the undertaking to the ICO signed by Google in November 2010," an ICO spokeman said. The ICO has asked Google to supply the data to the ICO immediately, so that it can carry out forensic analysis before deciding on the necessary course of action. "We are also in touch with other data protection authorities in the EU and elsewhere through the Article 29 Working Party and the GPEN network, to coordinate the response to this development," the ICO spokeman said. “The ICO has always been clear that this should never have happened in the first place and the company’s failure to secure its deletion as promised is cause for concern,” he said. In responding to Fleischer's letter, Steve Eckersley, head of enforcement at the ICO, said he welcomed Google's commitment to continued co-operation with the ICO. "I confirm that the ICO now intends to examine the contents of the remaining UK payload data and I ask that the data is stored securely until such time that we can complete our examination," Eckersley said. In April, Google was fined for hampering the FCC’s investigation into the Street View project, but still claims project leaders did not want or intend to use the data collected.